The 'Made in America' revival is gaining momentum with a majority of manufacturing executives now ready to consider pulling some production back from China. A new survey published Tuesday showed a big jump in recent months in the number of companies considering "re-shoring" production from China, once favored for its low costs. Boston Consulting Group said its survey found most large U.S. companies now plan to move some production to America from China, or are "actively considering" the move. The number of firms that have shifted manufacturing to the U.S. from China, or will do so in the next two years, has nearly doubled over the past 18 months. The survey found the three main drivers of the trend are labor costs, product quality and a desire to be closer to customers. As lower energy prices and declining labor costs make America a cheaper place to manufacture goods, China's dynamics are also changing. Once a source of cheap labor, the country is seeing its advantage squeezed by rising wage costs and an impending labor shortage. More than 200 U.S.-based manufacturing companies with annual sales topping $1 billion took part in the Boston Consulting Group study. 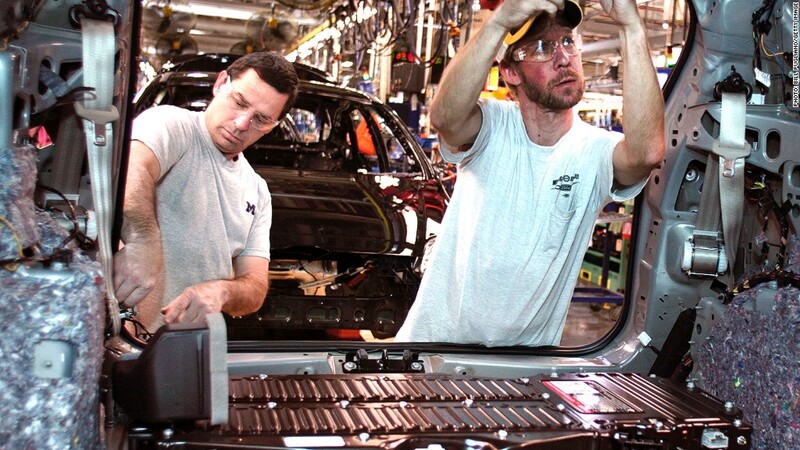 A pick-up in manufacturing is a crucial plank in the American recovery story. Already, several technology giants have shifted production back to the U.S. Google (GOOG)chief Eric Schmidt said it costs about the same to produce its Texas-made Moto X device locally as it would in Asia. Apple (AAPL) boss Tim Cook made a big splash last year when he announced production of some Mac computers would be shifted to America. But a stronger push by technology firms to manufacture in the U.S. is unlikely. Most component suppliers for tech companies are based in Asia, while China has far more skilled engineers needed to meet swelling global demand for smartphones and devices than the United States.